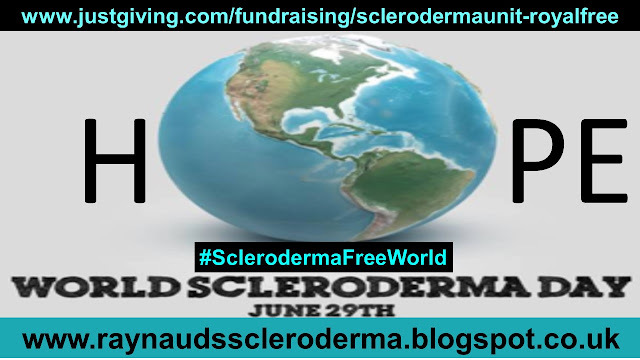 The skin is the largest organ in the body and more often than not, will be affected by scleroderma, as the name ‘sclero’ - thickening, ‘derma’ - skin, implies. 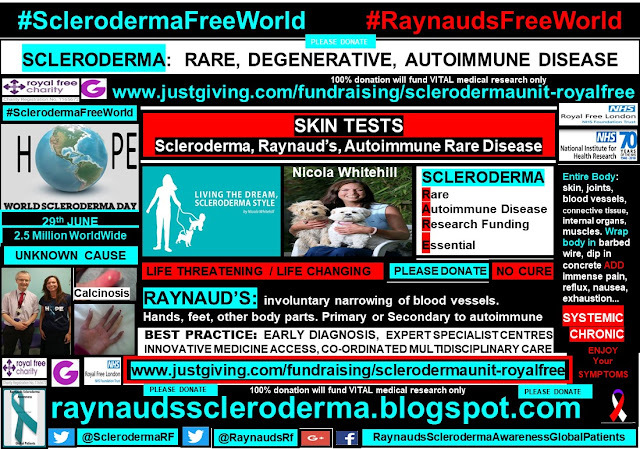 The exceptions are a SINE scleroderma diagnosis, as well as, a limited scleroderma diagnosis, could present with little or no skin involvement. 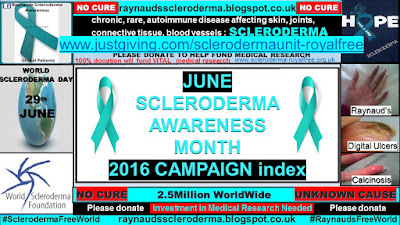 Here is a visual from my June Scleroderma Awareness Month Campaign 2016. 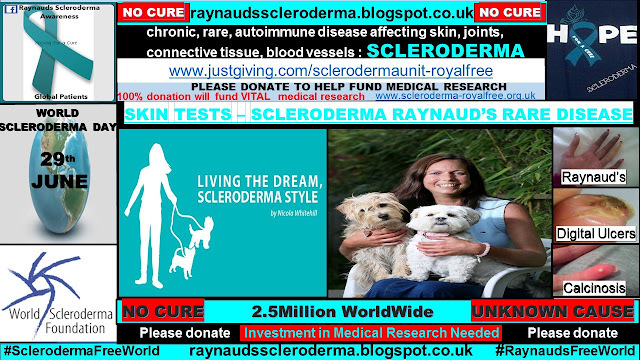 One of the usual diagnostic tests carried out to determine a scleroderma diagnosis is a skin biopsy. 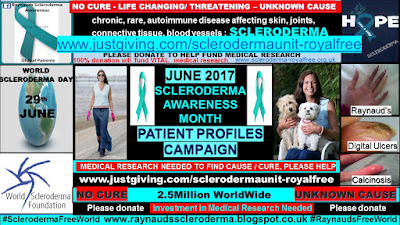 I am delighted to have avoided a skin biopsy- an invasive painful test on my scleroderma tight sensitive skin, for 19 years now. 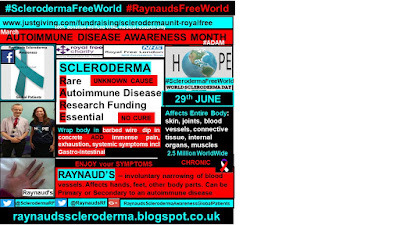 However, the growing lump on my forehead of the last three years has been a cause for concern and intrigue, further to me being prone to calcium lumps, which is now one of my long term scleroderma symptoms. 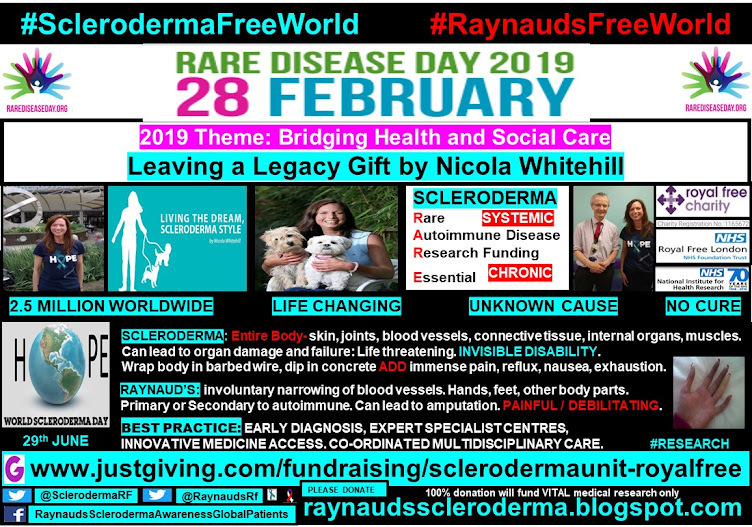 Although calcinosis is not as life threatening as organ damage, it can be extremely painful and contribute to organ damage. 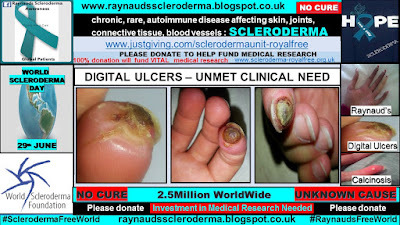 It is my view that calcinosis is one of the biggest unmet needs of the stable scleroderma patient. 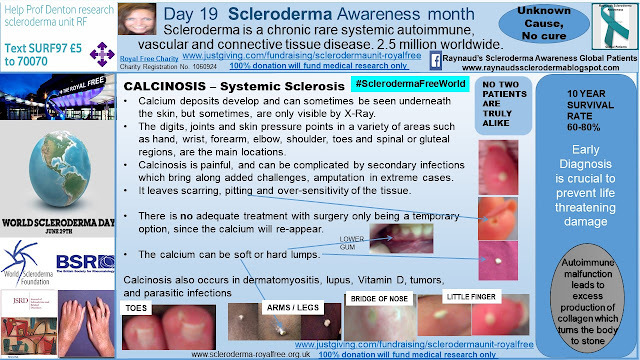 I discussed in more detail about calcinosis, here. 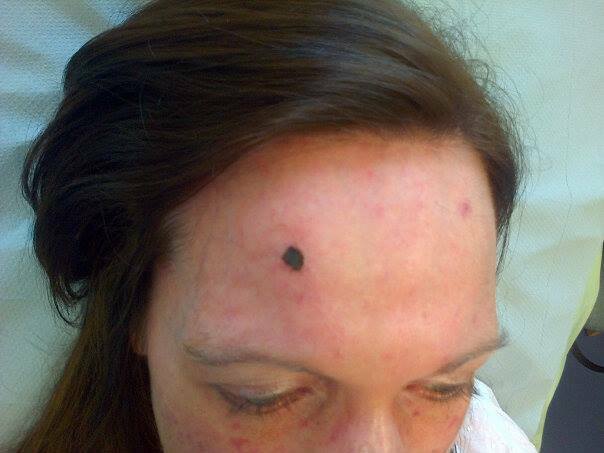 The lump on my forehead appeared as most of my calcium lumps have appeared – pain and tenderness to the skin at the site of injury, and then gradual discolouration to a white-ish colour, similar to a spot. 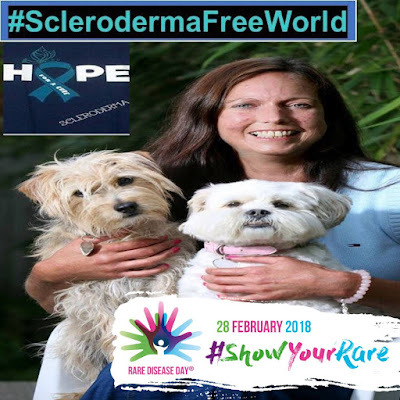 Although, they are actually a lot different to a spot, as spots can be squeezed and these lumps can not, and which, I have hours of experience of squeezing and prodding, and the scars to show for it. 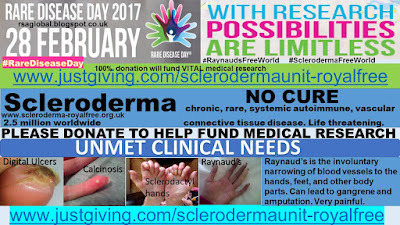 Further to the lump’s appearance I was referred to my local Dermatology clinic for an assessment and measurements to be taken. 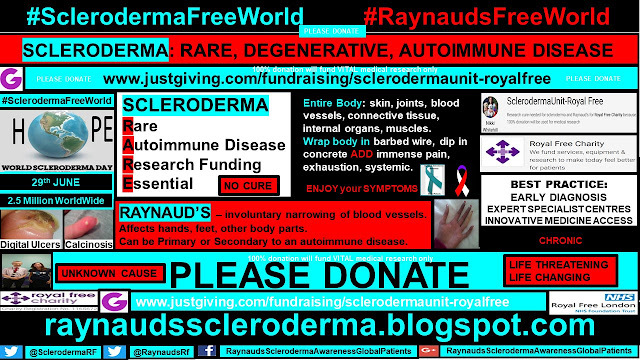 I was advised at this time, that a skin biopsy would be an option, in an attempt to identify more about the lump. 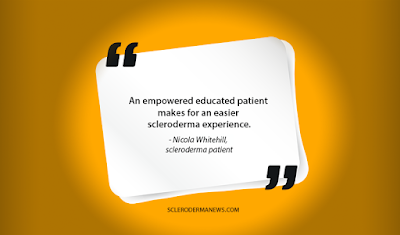 However, due to my years of experience with calcium lumps, I chose to delay any invasive surgery, mindful that my skin does not repair as quickly upon injury, and another scar, this time on my face. 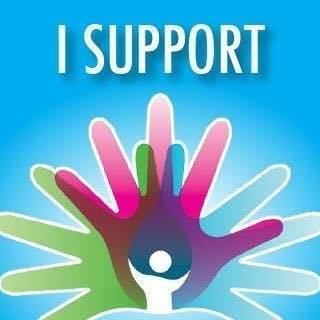 As well as, I am susceptible to infections due to 7 years of immunosuppressant use, even though I am now 12 years immunosuppressant free. 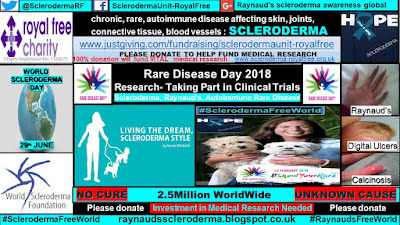 Being a long term patient with a rare disease with no cure, and little known about the cause, has taught me that ‘prevention is most certainly better than cure’ especially when it comes to infections which may have been avoided, such as coughs and colds. 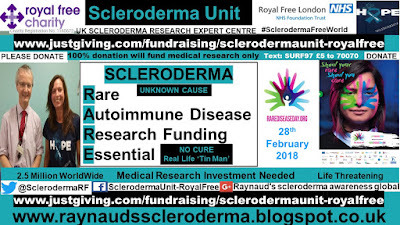 As I stated above, I really am elated that I managed to get to year 19 of my diffuse scleroderma diagnosis without having to have a skin biopsy. 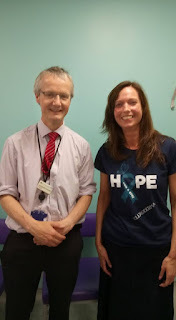 And, I am extremely grateful to the Dermatologist Doctor, Dr Tiberiu Bontea, at Ormskirk General Hospital (my local Dermatology center) for his expertise and patience over the last 18months, whilst I plucked up the courage to have the procedure, as advised from the outset. 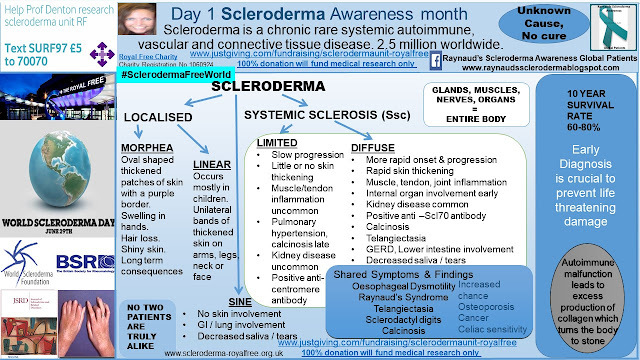 On the day of the procedure, I was very much comforted knowing that Dr Bontea had taken into account my scleroderma ‘special needs’ – tight skin and compromised blood supply combined with slow healing tissue repair issues, and so, he used a type of anaesthetic which would not cause extra contraction of my blood vessels (lignocaine). 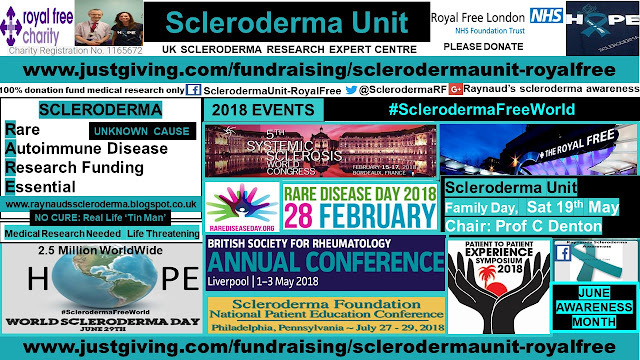 The medical requirement of this procedure shows the importance and need of a ‘shared care multidisciplinary approach’ for best practice and care for the scleroderma patient. 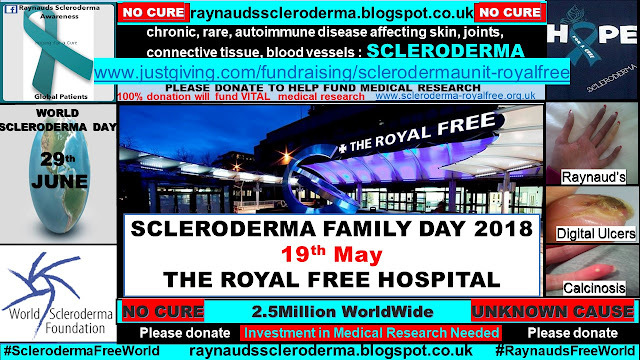 The entire procedure took about 20minutes, with only slight discomfort at the point of entry of the needle administering the anaesthetic, lasting a minute or so. Dr Bontea kindly let me look at the ‘specimen’ which had been excised, prior to it being sent for further testing. It did not look like a calcium lump. I am extremely grateful to Dr Bontea and the nurses for making the procedure as pleasant as it could be. 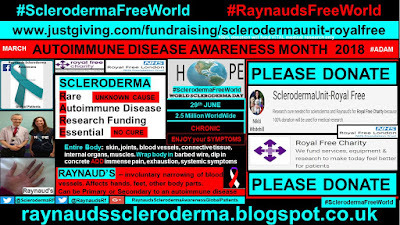 As well as, I am very grateful for my fellow long term scleroderma survivor friend Leyla, for her support, when I was having to accept that the biopsy road was the only avenue available, and of course, Thank You to all of my facebook global scleroderma friends for your comments and support and for sharing your personal experience of this scleroderma ‘added extra’. 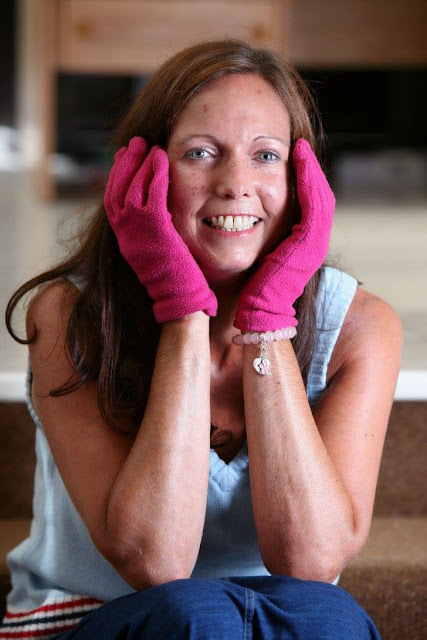 This photo was taken at the end of the procedure, and 4days later there is little change. 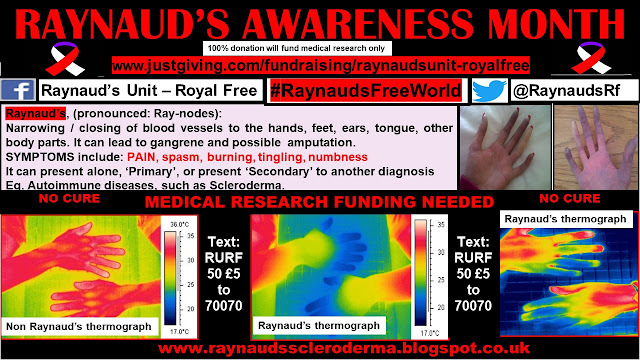 In the meantime, I am under house arrest in an attempt to provide the best conditions for a ‘speedy’ healing recovery. 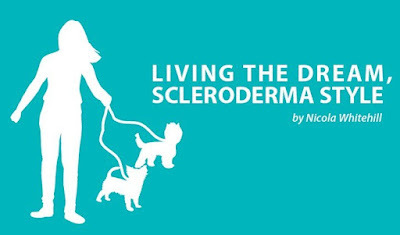 Living the dream, scleroderma style, hoping for a cure.